May Garden Rant « Friends of Fire Mountain on October – Get out there and Garden!!! We were away from our garden for the month of January, travelling in SE Asia (more on that later), but the results of our fall work paid off. We came home to a garden full of lettuce of multiple varieties. The snow peas are in full fruit and I have straggler beets from my summer crop that I left in the ground to mature. I just boil these as a side dish (I pickle most of my beet crops). I still had a great crop of red and white onions. I have given up on weeding arugula out of the entire garden; I just let it grow in the paths, so I always have some. All in all a good start for a tossed salad. Our trip to Vietnam and Cambodia was very instructive, a culture shock giving us insights into their history, our history and into a people who have been living off the soil in this area for thousands of years. The markets are an indicator of eating habits of the great majority the Vietnamese and Cambodian people. As much as I love the Vista Farmer’s market, it gets a 1 on a scale of 10 when you compare it to the street markets and the breadth of items available. These are very efficient gardeners, the country has not been corporatized in farming yet (yet!!!!) so we are talking about old style farming (Water Buffalo is the tool of choice!!). Everything is fresh every day. Imagine that here! 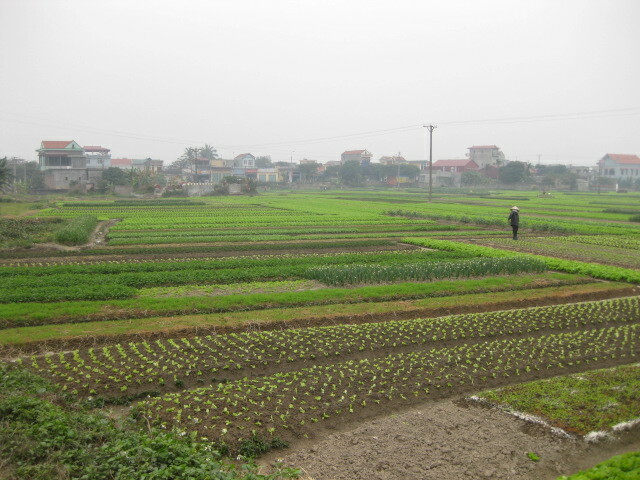 They transplant all of their seedlings, be it rice or lettuce, which means that they can optimize the space available. They can concentrate fertilizer and water on small areas to produce a tremendous amount of plants. Judging by what I saw, I would estimate that we are underutilizing our dedicated veggie garden space by a minimum of 50%! I am going to do this on my next crop of lettuce. The pictures I have here are obviously small commercial operations, but by the looks of it one 4’ x 4’ plot of lettuce could supply most of the neighborhood. This is a last chance to spray Volck Oil on your fruit trees before they leaf out; I would recommend you get right on it. Every year that I have sprayed my 40 year old nectarine and other stone fruits, the results have been much more rewarding than years I just got lazy and didn’t spray. One last aside, I remember when I was a kid in the ‘50s growing up in Oakland, my parents subscribed to Sunset Magazine. It was what was cool in Cal at the time. I started subscribing when we bought our first house, which was a mistake, because Kristine could always find something for me to do! Unfortunately, the magazine went into a decline. We received a promo offer last year, so I agreed to try it for $10 a year. It’s a little light and fluffy, but they have come back to presenting some good gardening tips. It seems to be worthwhile checking out. I hope everyone had a safe and good 4th. I am sorry to report that some of our neighbors on Fire Mountain don’t seen to understand the concept of fire hazards and insisted on setting off their own fire works. Try to reach out to your neighbors to educate them; I for one would prefer not to have my trees and home burn. Enough of that, let’s talk about the weather, which appears to be June gloom to the end of time. This cool weather is making it tough on tomatoes. I have wonderful sets on all my plants and have already harvested some great heirloom Druzbas (purple black and sweet) but the main body of tomatoes are staying green. We can only hope. Cukes are doing very well, once again like the tomatoes taking a long time to get rolling after transplant. Onions and green beans are doing well and with shade cloth my lettuce continues to thrive and we have new crops in the ground. This has been a good time to second crop tomatoes. Its time to weed between the veggies to cut out competition and to provide air circulation. I have been very happy with the results of thinning sun leaves on my tomatoes, particularly the lower ones. It really helps the plants stay disease free. one of the most spectacular plant collections in North County in the name of returning the area to its native condition, I am sorry but I would much rather see 50 puyas in full bloom than rabbit ear cactus. I can take solace in the magnificent epiphyllum bloom this year, the rain and the conditions produced several plants with over 30 buds and they are breaking loose now. This is a great time to plant your tomatoes, basil, green onions, summer lettuce; they have been doing really well in my garden this year. As usual I recommend Green Thumb in San Marcos for Heirloom tomatoes; they have a pretty good selection. I personally have never been to tomato mania at Quail gardens as I think they do it too early here to successfully plant, but I know they have good stuff. I am on my second round of tomatoes, having lucked out in my planting just before the last cold snap. I have my first set too! The beets have been outstanding this year, a great crop to grow and put up. As most of my good friends know, I have had a very successful turnip crop too. It was a mistake planting, so of course they grew perfectly. They are wonderful young (like radishes) but kinda hard to give away as adults. Don’t shy away from summer lettuce; it can work, with the addition of some frames with 50% shade cloth and lots of water. Once again this year I am letting sections of the lawn (so beautiful in the rainy months) go dry and spending my water on veggies. Get out there weed, thin, mulch (very important this time of year) and plant. If your yard looks like mine, I imagine you will be spending a substantial amount of time weeding and re-weeding. I walk my dogs by our neighbors that replaced ground cover with succulents, rocks and gravel and feel a pang of jealousy. After the rain do yourself and your neighbors a favor and check all around your yard for standing water. The mosquitoes are out in force this year. I don’t know if Oceanside and Carlsbad have funds for vector control at the lagoon so we have to do our part in our yards. It appears that we may get only sporadic rain for the balance of this month, so tune up the sprinklers, check for leaks and set the timers fro just before dawn so the water has a chance to soak in before the sun hits it. I am still rolling in lettuce and have been distributing it around the neighborhood. Really wonderful French varieties from seed that we brought back from a trip last year, which are also available on line, just type ‘French lettuce seed” in your search engine, there are lots of hits. This lettuce is so tasty you can eat it by itself. The snap peas were dug in yesterday. That’s a trick I learned from Mr. Ledgerwood himself. I dig slit trenches about a shovel wide and 12”-18” deep jamb the dead or mostly dead pea plants into the trenches, stomp them down and cover them with soil. It’s a great way to get nitrogen right back into the soil. It is always best to wait at least two weeks to plant seed over fresh compost as that gives the fly larvae that are inevitably laid on the plants time to mature and leave, otherwise they will use your seed as a food source. and put them in a fresh bed. 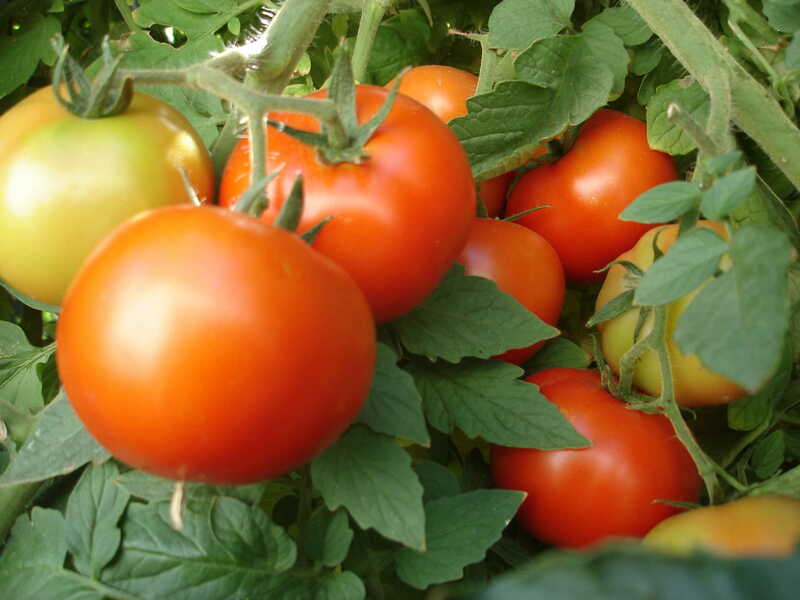 The general rule is to plant tomatoes when the night time temperature stays in the mid ‘50s. So what happen the last couple of nights- right back down in the ‘40s. Carumba!! I hope they will be ok.
Do check out the heirlooms, they present some weird and delicious fruit, but they are susceptible to more bugs and disease than the hybrids. I always have a couple of Early Girls, San Diego’s and Rutgers mixed.They produce dependable tomatoes every time. Love that rain! We haven’t watered for two months except for vegetable starters. I am sure since the residents of Oceanside are using less water this year, the City Water Department will have to raise our rates. Never the less Fire Mountain looks great, everything is green and I do mean everything. As soon as it dries out a little I will be filling all three of my green waste recycling containers with weeds. This is somewhat of an in between month for planting, too soon for the killer tomatoes and a little late on the winter lettuce type crops. We seek wisdom and guidance once again from the departed seed man of Carlsbad, Charles Ledgerwood, for our recommended March planting. A little wisdom I’ll repeat from last year for the newcomers: Our area is most excellent for growing beans and this is a great time to start. We grow pole beans on bamboo that we cut in our yard. I make a little mound of soil, hollow out a bowl in the center, stick four poles tilting away from each other in the ground and plant a sprouted bean near the bottom of each pole. The dirt basin makes for easy watering and feeding. Having the poles angled makes the beans easy to find. You can tie the poles together with twine if one starts to lean too far out, from the weight of the crop. Potatoes grow particularly well here too and they are so easy. Let a couple of store bought potatoes grow ‘eyes’ in a dark drawer, quarter them and put directly in the ground or in a pot (we use 5 or 15 gallon nursery pots); when the foliage withers, carefully dig up the little spuds. We have tried to plant tomatoes in March and the results have been spotty. Unless the month is uniformly warm (this one obviously isn’t) the plants seem to stagnate and when it warms up the growth is unimpressive. We now hold out until mid April. I am replanting all season lettuce; trying for one more crop of peas and watching the beets grow like Topsy. I have prepped one bed for late march Tomatoes. Be sure to check out Green Thimb in San Marcos for heirloom tomatoes and don’t forget TomatoMania at Quail Gardens March 20-21. ASPARAGUS, beans, BEETS, BROCOLLI, BRUSSEL SPROUTS, CABBAGE, CARROTS,CHIVES, COLLARDS, KALE, KOHL RABI, LETTUCE, MUSTARD, ONIONS, PARSELY, PARSNIP, PEAS, POTATOES, RADISH, RUTABAGA, MARROW SQUASH, SWISS CHARD and TURNIP. Acrolinum, Alyssum, Aquilegis, Armeria, Asparagus fern, Baasil, Bells, of Ireland, Calendula, Candytuft, Centauria, Clarkia, Cobea, Coreopsis, Cosmos, Cynoglosum, Dahlia, Daisies, Delphiniums,Dianthus, escholtzia, Foxglove, Didicus, Dusty Miller, Fountain Grass, Gaillardia, Gazania, Gloriosa Daisy, Geranium, Godetia, Gysophila, Hollyhock, Hunnemania, Impatiens, Larkspur, Linaria, Linum, Lobelia, Lupin, Myosotis, Nasturtium, Nemisia, Nemophila, Phlox, Petunia,, Platycodon, Rudbeckia, Salvia, Scabiosa, Statice, Schizanthus, Sweet Peas, Sweet William, Thumburgia, Torenia, Verbena, Viola, Vinca, Vendium, Virginia Stock, Wallflower and Wildflowers. Flower descriptions and preferences can be found in Sunset’s “Western Gardens”. We should be all be enjoying the fruits of our labors by now, early tomatoes, beans, beets and all the good stuff we planted in March and April. There is still time to rotate in summer vegetables that can be consumed in August and September. Our source is as always the “Reliable Seeds 1994” pamphlet by Charles Ledgerwood. BEANS, beets, carrots, CANTALOUPE, CORN , CUCUMBER, LIMAS, OKRA, parsley, PEPPERS, PUMPKINS, radishes, N.Z. SPINACH, SQUASH, Swiss chard, tomato, jicama, watermelon, egg plant and sunflower. Don’t forget to move your plantings around in your garden, change the rows you plant your tomatoes in, even spread vegetables around in your regular landscape. Egg plants are beautiful in bloom and fruiting as is chard. Asters, Balsam, Candytuft, Carnation, Celosia, Centaurea, Cobaea, Convolvulus, Calliopsis, Cosmos, Cynogiosum, Dianthus, Daisies, Dismorphotheca, Dusty, Miller, Fountain grasses, Gloriosa Daisies, Gourds, Gypsophilia, Helichrysum, Ipomea, Larkspur, Lavendaer, Lunaria, Marigold, Nasturtium, Phlox, Portulaca, Rudbeckia, Salpiglossis, Scabiosa, Salvia, Statice, Tithonia, Sunflowers and Zinnias. You can find plant descriptions and planting information in Sunset’s “Western Gardens”. Check for drought tolerance, which will be very important this year. You can also start thinking about succulents and cacti. Both are quite expensive in nurseries and stores so consider asking friends and neighbor’s for cuttings, set aside a little area for pots and by this time next year you will have plants ready to go into the ground!